(QIMC) to set up an Integrated Chlor Alkali Complex at Mesaieed Industrial City (MIC) in Qatar , whic is likely to commence by first half of 2016. The newly formed entity, KLJ Organic–Qatar W.L.L, will harness the power of KLJ Group’s strength in Chlor-Alkali & Chlorinated Paraffin markets in Gulf, Middle East and beyond. 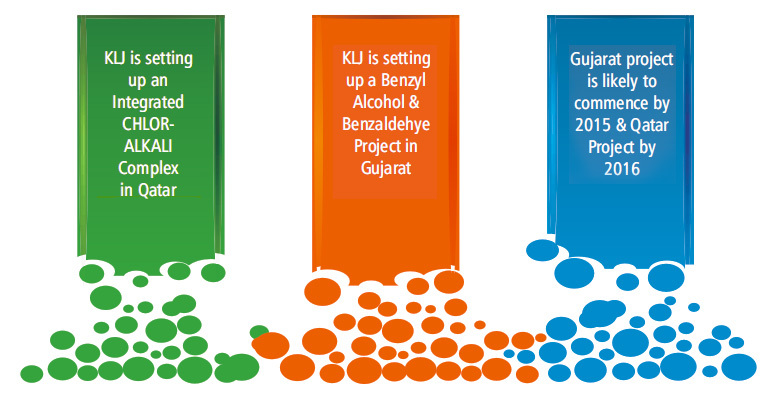 KLJ is diversifying into different chemistry of Chlorination of Toluene and its derivatives. The project is likely to be commissioned in Jhagadia, Gujarat by end of 2015.